Drums are integral to any song; they are what make a hit have rhythm and a solid groove. Drums are not just the stationary metronome jammed at the back of the stage. Essentially, drummers conduct the song and control the entire vibe. When you find yourself dancing and swaying to a song, you are following a beat, which is typically led by the drum track. 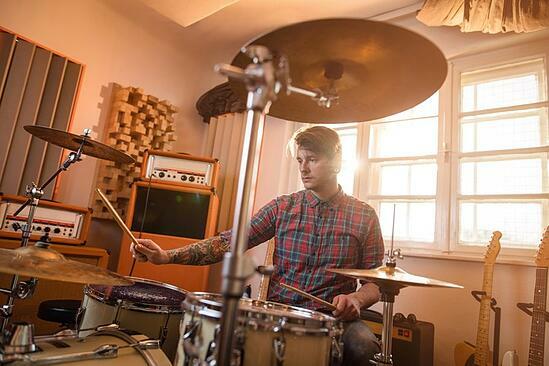 Having thin or weak sounding drums can really take away from what could be a strong track. Don’t be afraid to beat up your drums in the mix and get a little crazy. There are a few different ways that you can use compression in order to make your drums mix sound bigger and more full. But what exactly is compression? Compression is when you lessen the dynamic gap between quietest and loudest signals of an audio signal. If you’re working with live drums, you can use compression to make the kit feel like its all moving together and sounding bigger as a whole. Ultimately, there will not be a go-to preset that you can use to keep the exact sound and compression for each song. You should be using compression and all of your tools catered to the specific song. Controlling the level of attack and release on a compressor can help you, as well. You may have a specific drum that you want to have more punch, so you’d want to decrease the time on the attack in order for the compressor to engage quicker, therefore giving you that desired punchy sound. Lowering the threshold on your compressor can cause you to lose the body of your drums, so be sure to play around with it until you HEAR what sounds good. Don't be afraid to play around with the sound. Playing it safe is all well and fine, but think about all the different sounds you'll never discover if you never mess around! A nice compressor for drums would be the CLA 2A or 3A. When diving into the EQ, you should consider what you want your drums to sound like. You can get really intricate with EQ’ing drums, and it often depends on the genre that you’re mixing. As a rule of thumb, you should try to roll off as much of the low-end frequencies, minus the kick (and maybe the toms, depending) of course. Drums do have some tone to them, as well. You can spike up a frequency and roll it left to right to find the key of your drum and tune it from there on out. If you want your drums to have a more sparkly & bright tone, try boosting around the 10k range. The Low-mid range can be essential in keeping your drums sound big as well, so make sure you don’t cut too much from that range. When programming drums, picking the right sample can have a major impact on how the final sound of your drums can turn out. Picking samples with “big” transients will help you get the punch you’re looking for. You can see these transients when you pull the sample into your DAW. According to dubspot, transients are best described as, "a short burst of sound that contains higher frequencies than the harmonic content of that sound." In addition, many websites will show the waveform so you can get an idea of how it looks. The goal is to practice training your ear to hear the difference between a punchy drum and something more rounded rather than just looking for a transient, but visualizing does always help. Once you pick the right sample, some of the work is already done for you. Important Tip: Many samples are already compressed when you download them, so sometimes you will find that compressing them won't do much for you. Using distortion can really make drums sound crunchy, but in the best way. Remember earlier when we said to get a little crazy? This is what we meant. You’ll find that not only can distortion help make your drums cut through the mix, but you can create a whole new type of sound with it. You can find some cool distortion plugins for around $100-$200. A good go-to is one named “Decapitator,” made by SoundToys. There really isn’t a lot to know about using this specific plugin. Once you open it up and start twisting knobs, you will immediately be able to hear the difference in the sound of your drums. Distortion may be more fun than necessary, but either way, it will help your drums sound bigger and more full. A good tip is when you are beginning to plan how you want to pan your drums, consider how a drum kit is set up. Your hi-hats are on the left, cymbals (such as the ride) are on the right, the kick is in the middle, and the list goes on. This doesn’t necessarily mean you have to hardpan each of these drums one way or the other, but just give them enough room to breathe. Also, panning your drums will make the drums sound bigger because it will make it sound like the space is being filled. Imagine it as filling the room (or your headphones). We strongly advise that you keep the Kick and Snare in the middle. When you pan one thing to the left, it is a good idea to pan something else to the right! There is no "one way" to make your drums sound big. Remember to always get your drums sounding right for the song you’re working on. But also remember, there isn't a right. Play around and find what you want. Presets are great for a starting point, but won’t always work for any song you’re working on. Don’t be afraid to try new things, even when just mixing your drums. Be creative, have fun with it, and enjoy making your drums sound huge. Are interested in learning how to craft the perfect mix? One of the best top-rated ways to learn how to mix is by attending an Accredited Music College like the Atlanta Institute of Music and Media. 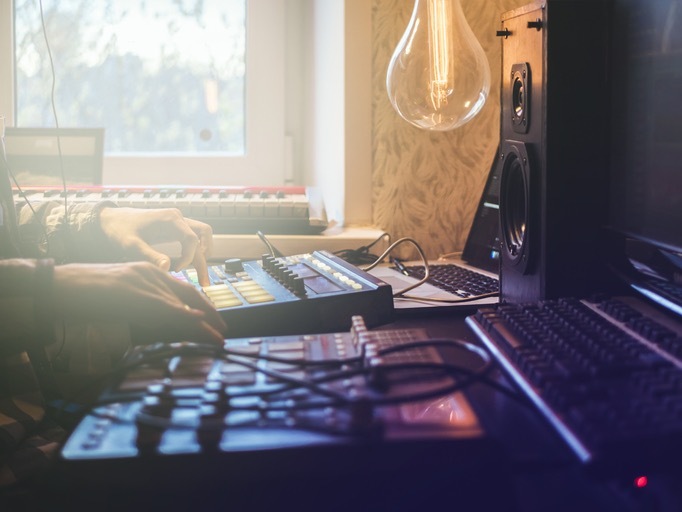 In addition to industry-leading instructors, exclusive studios, and excellent equipment, AIMM offers a Certificate in Music Production and a Music Production and Audio for Media Degree. But wait, are you more interested in drums than mixing? That is cool, too! AIMM has a Drums Certificate Program and a Music and Technology Associate Degree with a focus in Drums. Click the link below for more information on AIMM today!